In an exciting game played in Brinny on Saturday Valleys won their first game in this competition. Sliabh Rua started well with two early goals. Rovers came into the game with excellent points from Laura Brew and one from Maeve O Brien. However Sliabh Rua struck for another goal just before half time leaving the score 3-1 to 0-5 at the short whistle in favour of the visitors. Valleys upped their performance in the second half scoring 6 points with Grace O Reilly and Jennifer O Donovan getting on the score board. Rovers goal came when Laura Brew's 45 found the net. Laura finished with a score of 1-8. Sliabh Rua were denied a late goal with an excellent save from Ciara Murphy and their only second half score was a pointed free. 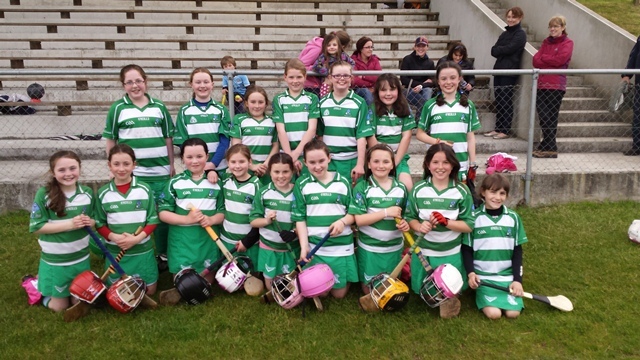 The Valley Rovers Under 12s Camogie played in the South East Gala Finals in Coachford on Saturday. The panel of 24 was split up in to two teams, to play twelve a side against two teams from Watergrasshill and Rockban. Both games went very well, and were evenly matched throughout the game. Plenty of skills on both sides, and it was a great experience to play teams who they never met before. It finished up with one of the Valley Rovers teams winning their match. We are so proud of all girls on both teams at the way they played today. Valley Rovers camogie under 10s played an amazingly courageous game against Ballinscarthy on Saturday morning. 20 girls travelled to take on a very strong Ballinscarthy team and every single player contributed significantly to ensure we got a great result. After a tough start, Ballinscarthy attacked very impressively and Valleys put in an amazing defensive display to limit the impact of the strong possession of Ballinscarthy. Valleys continued to improve into the next period and took the game to their opposition. The final period of play saw Valleys command the lion share of both possession and territorial advantage, shooting some great scores. Great fun was had by all and it is very clear to see the great progess being made by each player, with clear evidence of the hard work being done at home and at training by the girls. Those who played and impressed on the day were Emma O'Sullivan, Emma Kelly, Siofra Kelleher, Kate Manning, Ella Ronan. Lauren Rumley, Caoimhe Hurley, Anna Collins, Holly Flynn, Emily Barry, Ciara O'Sullivan, Isobel Linehan, Grace Monoghan, Erica Crowley, Fiona Twohig, Niamh Quinn, Livia Wade, Muireann McCarthy, Sarah Kenny, Aoife O'Donovan. 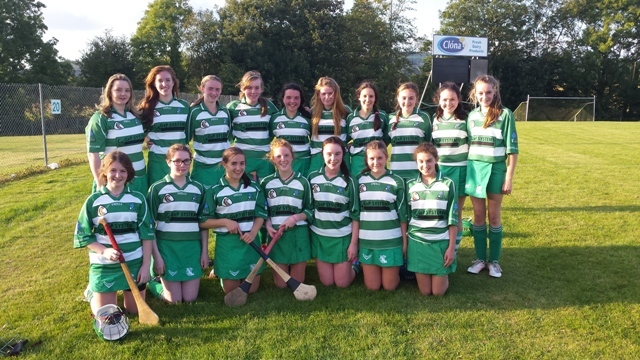 The Valley Rovers U12s camogie team played a fantastic league game in Clonakilty on Tuesday. The game got of to a quick pace with tremendous amount of team work throughout the game. Both teams were evenly matched in the first half, however Valley Rovers lead at the break by one goal and a point. Valley Rovers came out in the second determined to increase their lead, and put into practice key skills learned at training. Rovers also used the learning and experience from their first match. As result they managed to score more goals to ensure that they kept the lead. There was some great team spirit expressed by the players, and great team work that gives the club the confidence that there are great things to come from this team in the next few years. We are so proud of them. 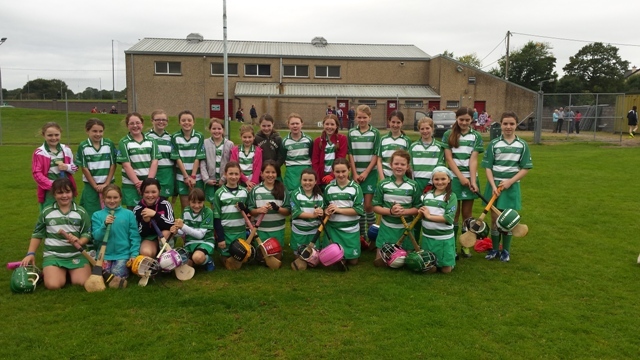 The Valley Rovers U12s camogie league got of to a start last Thursday. It was a fresh and windy evening as they played the Enniskeane U12s in Enniskeane. They went there with a team and one sub, playing a team with 9 subs. It was a well even played game throughout with some great shots and team work on both sides in particular in the first half. Enniskeane led at half time by a goal, as they played with the wind to their backs. Speaking to the referee at half time, he was very impressed with the standards and skills of both teams. Valley Rovers worked hard in the second half playing against some extra fresh legs. Again there were some great skills from both teams in the second half. Enniskeane won the first match of the season, but a great game was had by all, and great experience achieved especially for the majority of the Valley Rovers team who moved up from U10s this year. We are so proud of them. On Sunday Valleys took on Sars in league Semi Final and unfortunately had to line out with some injured and sick players and even though valleys battled hard to the final whistle Sars were the better team on the day. Panel Ciara Murphy, Leona Murphy, Niamh Lordan, Mary Ellen Sweetnam, Casey O Sullivan, Sarah Murphy, Michelle Cottrell, Emily Palmer, Maeve O Brien, Ciara Richardson, Rachel O Sullivan, Katie Lynch, Marog Murphy, Cathy O Donovan, Ellen Casey. On Sunday Valleys played the last league game in their section against Fr O Neills in a game played under heavy rain in Brinny. Valleys began well scoring two early points but Fr O Neills hit back with a goal. This was to be their only score of the first half while Valleys went on to score a further 1-3 leading at half time by 1-5 to 1-0. Valleys continued to hold the upper hand for the second half scoring a further six points while excellent defending held Fr O Neills to 0-3. Valleys now qualify for league semi final which will be played on Sun April 13th. Panel. Ciara Murphy, Casey O Sullivan, Niamh Lordan, Jennifer Murphy, Leona Murphy, Mary Ellen Sweetnam, Eimear Cummins, Michelle Cottrell, Emily Palmer, Ciara Richardson, Sarah Murphy, Katie Lynch, Rachel O Sullivan, Lisa Lynch, Marog Murphy, Meave O Brien, Ellen Casey, Rachel O Sullivan. On Saturday Valleys took on Carrigaline in their second league game. Valleys settled quickly into the game scored a hand passed goal. Scores were hand to come by for the remainder of the half with Valleys leading at the short whistle by 1-2 to 1-0. Valleys up their game in the second half scoring a further 2-1 and good defending limited the Carrigaline scoring to a goal. Valleys won on a score of 3-3 to 2-0 and now play Fr O Neills on Sun next in Brinny in their final group match. Valleys camogie under 10s and under 11s got the year off to a very positive start with a very impressive performance in the indoor blitz in Riverstick on Saturday. Notwithstanding being only back training for 1 week they performed with great skill, enthusiasm and determination. Valleys had 2 under 10 teams and 2 under 11 teams and equipped themselves very well, playing 3 games each, and defended and scored with great conviction. Valley Rovers got the year off to a winning start when they defeated Ballincollig in their first game in U18B league. In the first 10 minutes the teams were evenly matched, but Valleys hit a purple patch soon after, scoring two well-taken goals. Valleys led at half time on a scoreline of 2-5 to 2 points. Scores were harder to come by in the second half however, with Valleys only adding one other point to their total tally. The game ended on a scoreline of 2-6 to 4 points.